We started developing new DCImanager 6, a control panel for server and data center management. Pavel Guralnik, ISPsystem CEO, told more about DCImanager 6 features at the meeting with partners and clients on March 22. DCImanager 5 is capable of managing servers and other data center equipment: switches, routers, PDUs. 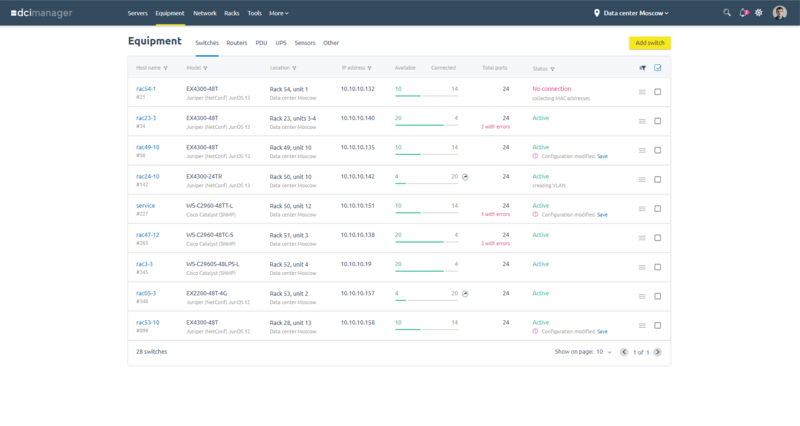 With DCImanager, you can detect servers automatically, reboot and troubleshoot servers, collect statistics, and control your inventory and spare parts. However, this control panel looks pretty outdated now. We were adding more and more features to it, and its interface has eventually become very cumbersome. For a new user, it may be difficult to find something without documentation or support. Also due to some architectural limits, we couldn’t implement some features properly, such as remote location management. If you add too many equipment pieces to DCImanager 5, it may start working slower. Before we started developing our new DCImanager, we had made some research on the IT infrastructure market and talked to our existing clients. Demand on colocation is rising. Companies prefer to colocate their equipment in third-party data centers. It diminishes their server maintenance costs without any losses in quality. In such a case, you don’t have to administrate your servers, support a certain temperature level, take care of uninterrupted power supply and backups. The data center market is growing in both money and racks. Providers try to install more equipment in the same area. Hybrid solutions start to be on the roll. A lot of companies have already tested cloud computing, understood that it is not really cheap or efficient sometimes, and started to go back to the on-premise model. The market today looks for a golden mean between private and public clouds, local and cloud infrastructure, and oftentimes companies choose hybrid models. AI and machine learning are more and more involved in equipment data processing and building forecasts to predict potential issues. As for the users, they all want to manage their equipment from a single point without doing a lot of stuff manually and know about potential issues before they occur. We create the new DCImanager version taking into account the downsides of the current generation, market trends, and user feedback. optimize work with a few data centers in one panel. New interface.When developing the new UI, we wanted the key functionality to be right up your sleeve. Below you can see the prototypes of it. Network equipment management. In DCImanager 6, users will be able to see the status of any equipment and go to its settings very swiftly. It will be possible to make backups of configuration files to restore network configuration. We will also change the process of adding new equipment. Right now, new processing modules can only be added by ISPsystem developers. We want to add the self-learning system to DCImanager 6, which will change this situation. This idea is currently being elaborated. Predictive monitoring and smart inventory. DCImanager 6 will be able to notify an administrator about any issues that occurred or might occur soon via different channels: the monitoring dashboard inside the panel, messengers, email. The data center map will be changed completely. We want the new control panel to help in finding the best place for locating new equipment, or show what equipment is about to run out and available in reserve. Smart inventory will help to find this information in the panel so you won’t need to go to a rack or to the warehouse to check it. Detailed real-time statistics.DCImanager 6 will show statistics on every server, its CPU and RAM load, temperature, disk space, SMART, etc. Device search. 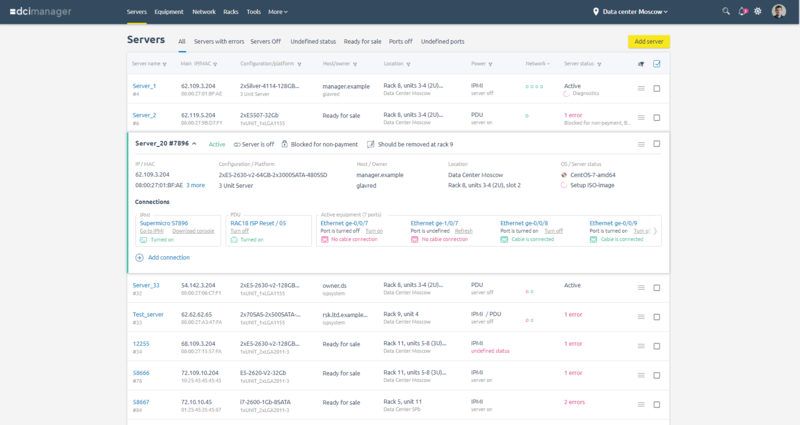 We want to improve server search and make it more clear, as well as automate the search of other devices that work via SNMP such as switches, routers, PDUs, etc. Colocation. In DCImanager 5, colocation is only available for servers. In the new version, you will be able to sell racks fully or partially for colocation of your clients’ equipment. The price for DCImanager 6 will be calculated per devices as opposed to racks. One device costs 1 euro. A device means any equipment except temperature sensors. Such monetization model will help us in the development of the product and its team, as well as in adding new features faster. There is no release date yet. Just like with other products, we develop it gradually stage by stage. As soon as we have the alpha version ready, we are going to call everybody to test it and leave feedback. The strategy of migration from DCImanager 5 is still being discussed internally but we are pretty sure that we will be able to introduce the one-button-migration. We’ll tell you more about it once we’re reaching the release date of the first version.